Javy Ayala took on former UFC heavyweight champion and mixed martial arts legend Frank Mir at December’s Bellator Hawaii: Salute The Troops event. Many fans and analysts expected that Mir would emerge victorious when his bout with Ayala was first announced. In the first-round of the fight, Frank Mir appeared to be getting the better of Ayala on the ground. Mir was attempting submission after submission, but Ayala remained poised and avoided getting caught. After the first round, Javy Ayala went back to his corner and knew he had to keep the fight standing. In the second round, he did exactly that. He landed punch after punch and then Mir’s mouthguard fell out. Ayala then got Mir up against the cage and kept on throwing elbows and punches to which Mir had enough and had tapped. However, at first, Ayala didn’t even realize Mir was tapping. When the ref stepped in, the fight was over and Ayala had earned his biggest win to date. His résumé now has a win over one of the greatest heavyweights of all-time in Frank Mir. The win over Mir snaps Ayala’s two-fight losing streak. But, when fighters lose two in a row, they are mad at themselves, but not Ayala. He has had a tough stretch of fights and is now 2-2 in his last four. Ultimately, Ayala is celebrating the biggest win of his career, and as he should be. For now, Mir is calling for a rematch, but for Ayala, it isn’t up to him if a rematch is next. Now, after a win against Mir, the hope is, this is the start of a run to a title shot. 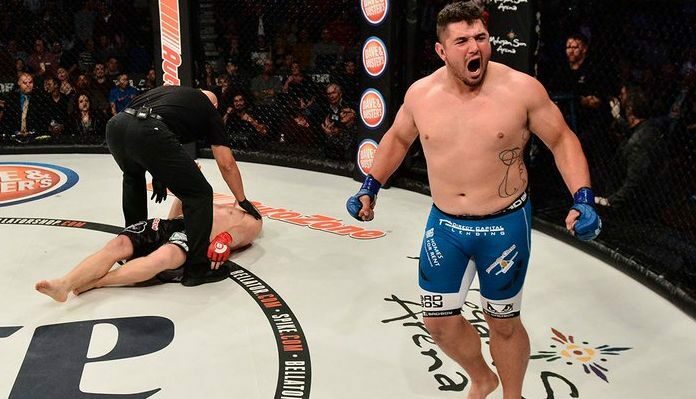 People now know Javy Ayala is a threat to any man on the Bellator heavyweight roster. Who do you think Javy Ayala should fight next?